Today we are back in the West Midlands for another image from the past featuring two of the original T69 trams on Midland Metro. This image was captured on 23rd September 2014 – only four years ago but a lot has changed in the intervening years with the trams now long gone and even a new name for the system – and shows two different liveries meeting at Soho Benson Road. 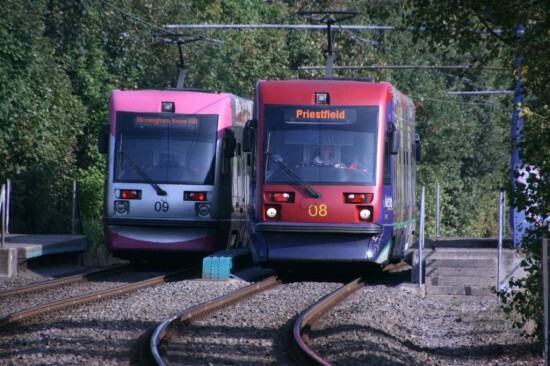 On the left we have 09 – carrying the later Network West Midlands Silver & Magenta livery – with a service for Birmingham Snow Hill whilst we also see 08 which is heading towards the Soho Benson Road stop as it works through to Priestfield. 08 is in the original Red, Purple, Yellow, Green and Grey livery. Both trams have now been scrapped having been sold at auction.